Would you or someone you know like to learn how to use the internet or improve digital skills? Get Online Week is about encouraging people to ‘Try 1 thing’ online - to use the internet to do just one thing you’d normally do face to face or over the phone. It’s the ideal opportunity to try out the Council’s new online services. Maybe you want to make an appointment to register a new birth, apply for a school place or report a faulty street light or blocked grid. The easiest way to contact your council is through our website. Our ‘Do it online’ area offers you a quick and easy way to report, apply and pay for things and find out information on a wide range of services. If you need help with the basics of getting online or with accessing council services online, call in to your local library where our staff are always happy to help you get started. If you don’t have a computer or broadband or Wi-Fi at home all libraries in Stockport have free to use computers and Wi-Fi. During Get Online Week there are a number of special sessions including support with using an iPad or tablet. Perhaps you would like to know more about the Library apps you can use on your tablet to download e-books or the latest e-magazines? Just ask your local library for details. Councillor Elise Wilson, Stockport Council’s Cabinet Member for Reform and Governance, said: “As a Council we are keen to support Stockport residents to get online. There are so many benefits, from keeping in touch with friends and family, to saving money or learning new skills for work or pleasure. 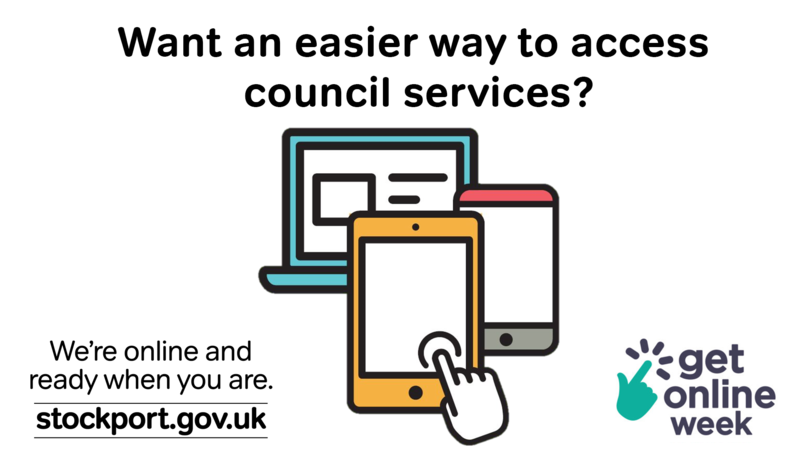 It only takes a few minutes to sign up and once you’re set up, you can access all your information on Council Tax, benefits, bin collections, appointments and more. It works on mobile phones, tablets and computers, so it’s quick and easy to go straight to the information you need.